The cellulose in wood pulp, when dry, has the consistency of fluff or lint – a layer of wood pulp cellulose has mechanical properties reminiscent of a wet paper towel. Not what you might expect to be the source of one of the strongest materials known to Man. After all, paper is made from the cellulose in wood pulp, and doesn’t show extraordinary strength or stiffness. 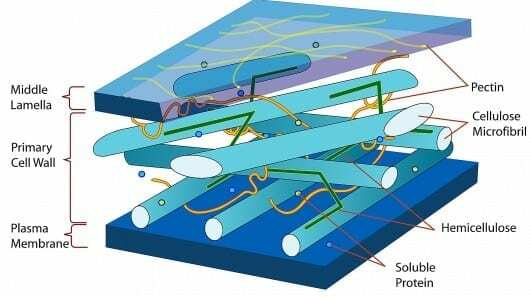 Further processing breaks the cellulose fibers down into nanofibrils, which are about a thousand times smaller than the fibers. In the nanofibrils, cellulose takes the form of three-dimensional stacks of unbranched, long strands of glucose molecules, which are held together by hydrogen bonding. While not being “real” chemical bonds, hydrogen bonds between cellulose molecules are rather strong, adding to the strength and stiffness of cellulose nanocrystals. July 10, 2014 - From McDonald's To Organic Valley, You're Probably Eating Wood Pulp NPRMany processed foods contain cellulose, which is plant fiber that is commonly extracted from wood. It's used to add texture, prevent caking and boost fiber. January 29, 2019 - What’s really in your potato waffles? The Irish TimesSupermarket waffles are highly processed but can evoke a taste of times past.